What kills me about Bollywood animation such as this one and (I will probably catch all kind of devil for this addition) "Roadside Romeo" is the bubblegum pop track. It's like watching "High School Musical" in Hindi and animated. Yes, I have not seen much good said about "Roadside Romeo" by anyone. Reportedly the dismal Indian box office for it was a major reason for the decision to postpone the release of "Koochie Koochie Hota Hai", which does look much better judging by its trailer. Don't get me wrong. I came from the cute school of animation, Preston Blair and Fred Moore and the like, but this is just over the top too cute. I would definitely steer clear of it. Hoo-Hah! Cartoon Brew reports that Indian animation studio Prana, which produced the unreleased “Koochie Koochie Hota Hai”, has just acquired the bankrupt American Rhythm & Hues studio, which most recently provided the VFX for “The Life of Pi”. 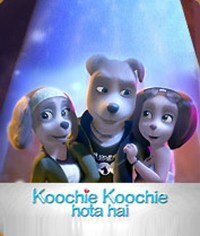 Although acknowledging that Prana has provided solid work for the Weinstein Brothers’ animated “Hoodwinked” and Disney’s upcoming “Planes”, CB’s Amid Amidi snarkily emphasizes the Indian studio’s unreleased Hindi-language CGI “Koochie Koochie Hota Hai”, “which its producer has described kinkily as a “love story between three dogs,” has been finished for over three years, but it is filled with so much AMAZING that it cannot be safely released into theaters without sending audiences into dangerous states of euphoria. […] Rhythm & Hues’ days of sliding by with amateur hour ‘Life of Pi’ graphics are over; they’ve got to step up their game if they want to impress on the sequel to ‘Koochie Koochie Hota Hai’.” The CB report closes with the anthropomorphic-animal-filled CGI trailer to “Koochie Koochie Hota Hai”. Well, let’s hope that all of this is enough to finally get “Koochie Koochie Hota Hai” released.